Alluvial Capital Management commentary for the fourth quarter ended December 31, 2018. It was a difficult quarter that capped off a challenging year. Markets around the world plunged, many experiencing declines not seen in a decade. Alluvial Fund was not immune, down 13.5% in the fourth quarter. While the loss hurts, Alluvial Fund did what it is meant to do. Our collection of obscure, often illiquid, under-followed holdings held up far better than small company benchmarks like the Russell 2000 Index, which produced a total return of -20.4%. 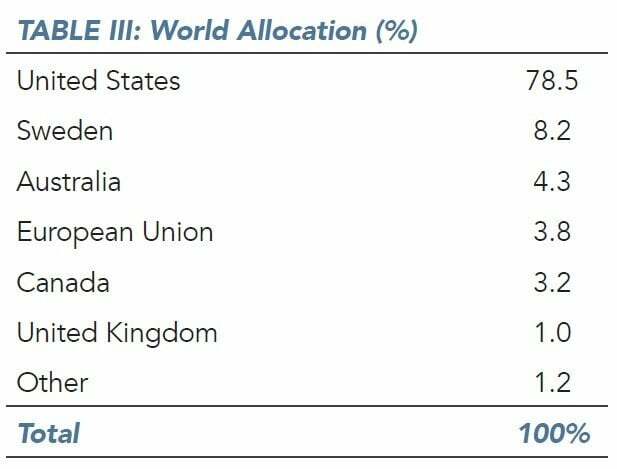 For the full year, Alluvial Fund’s -9.0% return bested the Russell 2000’s total return of -11.2%. Since inception, Alluvial Fund remains well ahead of all relevant benchmarks. The end of 2018 represents five years of professional money management for Alluvial Capital Management. From the beginning, I have asked investors to judge our approach not on any particular year’s results, but on what we accomplish over multiple year periods. Enough time has gone by to do so. From Alluvial’s official start on April 1, 2014 our flagship strategy (separate account composite from inception to December 31, 2016, Alluvial Fund, LP thereafter) returned 71.3%, net of all fees and expenses. The S&P 500 Index’s total return over the same period was 37.7%. For the Russell 2000 Index, 27.7%. The strategy works. Focusing on companies and securities that are ignored by the market due to factors like small size, illiquidity, or other stigmas is an effective means of identifying mis-pricings. Whether we are buying traditional value stocks, cheap growth companies, or special situations, investing where other funds cannot due to size or institutional constraints yields good results. The strategy does not work every month, quarter, or year. The securities that Alluvial owns are traded in the public market, which makes them subject to the whims of the market. When the market falls, our holdings typically will as well. While this is our first full year of negative returns, we have experienced periods of relatively poor performance before and we will again. We hope to outperform over time by investing at prices well below the intrinsic values of the securities we buy, but the pace at which price converges with value is unpredictable and outside our control. Finally, your manager is not finished learning. When I reflect on all the effort I poured into Alluvial over the last five years, there is no question in my mind that I have improved as an investor along the way. I want to be able to say the same in 2024, and I will put in the effort needed to achieve that. I will never manage to be free of cognitive biases, blind spots, or knowledge gaps. No one can. But I can improve, and I will with time. I like to start with the negative, and this letter will be no different. While I am satisfied with Alluvial Fund’s 2018 performance on the whole, we suffered from some unnecessary and self-inflicted wounds this year. In each case, my mistake lay in buying a company that in retrospect, did not meet my standards for management integrity and transparency, operational quality, or balance sheet strength. The first, discussed earlier in 2018, was ALJ Regional Holdings. I over-estimated management’s integrity and ability or willingness to provide reasonable performance forecasts to investors. A terrible quarterly result released soon after healthy guidance cost the company much of its goodwill with investors. The heavy debt load the company carries also weighed heavily on the shares, which fell more than 50% in 2018. Fortunately, I was able to read the writing on the wall and exited with only moderate losses. Another was Fusion Connect (formerly Fusion Telecommunications.) This is a case where a fundamentally reasonable business model has been unable (so far) to overcome the headwind of a balance sheet weighed down with high-cost debt. The result has been free cash flow well below my initial expectations and a sagging share price. Fusion was never a large position, so the impact on our portfolio was limited. But that’s beside the point. I never should have bought Fusion at all. Owning it cost us the opportunity to own other, better holdings. I should have been more skeptical of School Specialty’s business model. A low margin distributor facing pricing pressure has little room for error and must execute flawlessly. Had School Specialty done so, I believe it could have produced free cash flow of nearly $3 in 2018. That’s not what happened, and here we are with the company’s equity valuation cut in half. I happen to think selling at this level would be a mistake. Management has had a fire lit beneath them with large shareholders displeased. I expect operational improvements and perhaps even an opportunistic bid for the company. However, I shake my head when I think of the companies we could have owned instead while School Specialty struggles. Losing money always stings. But the pain is doubled by the troubling fact that money invested these poorly-performing securities is money that could have been invested in other holdings with honest, capable management, excellent business prospects, and strong balance sheets. Over the latter half of 2018, I made a concerted effort to review our holdings and shift the portfolio toward my highest quality ideas. I do not think doing so has sacrificed any return potential. Rather, I think it has created a portfolio that is more resilient to economic and market shocks. I believe this approach has already born fruit, evidenced by Alluvial Fund’s out-performance during the fourth quarter’s route. On a more positive note, our largest positions closed out the year making excellent operational moves and setting themselves up to shine in 2019. Nuvera Communications is now our largest position. The market is not pricing in the uplift in cash flow that will result from the company’s summer acquisition of Scott-Rice Telephone, plus the FCC’s increase in A-CAM Funding. The company’s third quarter results showed progress toward integrating Scott-Rice and increased revenue and earnings as a result. 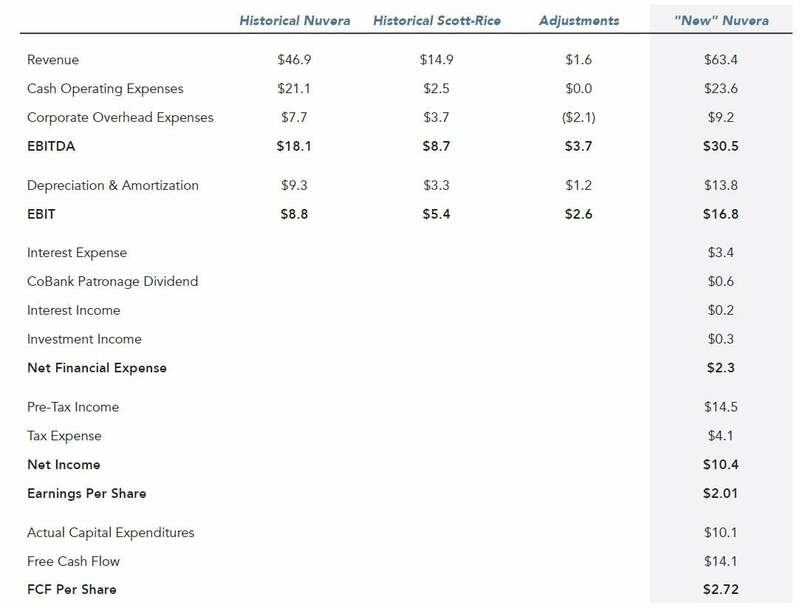 Nuvera should produce around $14 million in free cash flow per share in 2019, assuming reasonable cost savings at Scott-Rice. Of that $14 million, a little over $4 million is earmarked for required debt reduction, at least $2.7 million will be paid out in dividends, and the remainder is available for discretionary investment or further debt reduction. At less than seven times 2019 free cash flow, shares are a steal. It could take a little while for the market to catch up to Nuvera’s new cash flow power. Financial statements won’t show a full year of Scott-Rice’s contribution or the increased A-CAM revenue until late 2019. It doesn’t bother me if shares hold steady for a while. I’ll happily buy more at this price. MMA Capital Holdings (formerly MMA Capital Management) acted to recycle assets into higher- yielding opportunities. The company sold most of its low-income housing-backed bonds in order to increase its solar construction lending activity. Reallocating capital will increase MMA’s earnings and hasten the use of its NOLs. Despite the move, shares continue to trade at a 26% discount to projected year-end book value. The company continues buying back stock hand over fist and recently converted from an LLC into a C Corporation, making its shares eligible for inclusion in certain indexes. 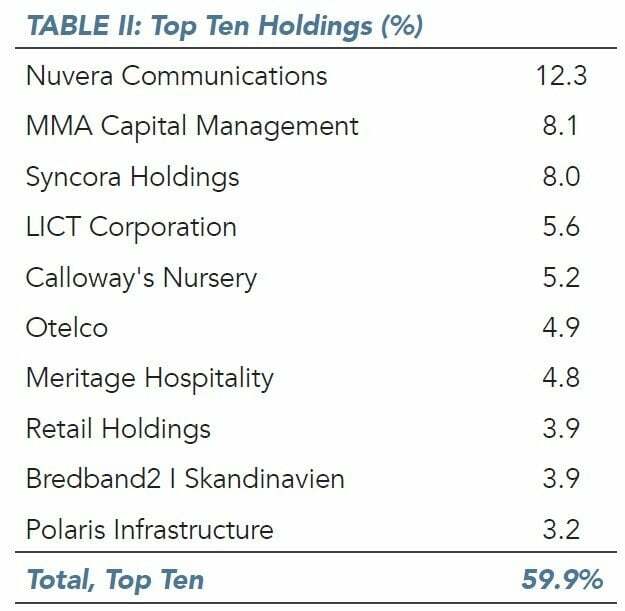 Just as with Nuvera, I don’t mind if MMA’s shares linger at this low level for a while. I hope the company can buy back another 10% or more of its shares in the high $20s, which will only increase book value and earnings per share once the revenue from increased solar construction lending rolls in. Syncora’s long journey from distressed insurer to asset-rich holding company is nearly complete. The company’s limited remaining insurance book continues to run off and the company is taking steps to pay down its legacy liabilities. Earlier this month, the company repurchased preferred shares in a subsidiary at a discount to par value. The company also sold some of its Detroit land and received a large cash payment in a lawsuit settlement. Following these actions, adjusted book value should approach $7 per share. The current price of $3.85 is a 45% discount. There is some uncertainty over the direction of the company following its substantial exit from insurance activities. Management intends to update shareholders in March on the company’s plans. My view on the value of Syncora shares will develop accordingly. No matter what combination of capital returns or new investments the company intends to make, intrinsic value is far higher than where the shares trade today. Other notable positions have reported good developments. Contura Energy finalized its merger with Alpha Natural Resources. The market for metallurgical coal remains buoyant, and the resulting cash flow will allow Contura to return capital to shareholders. The company will provide 2019 operating guidance in the coming days. I expect the company to complete its existing share repurchase program before long and to announce additional buybacks or special dividends. Shares of Polaris Infrastructure had a terrible time in 2018 as Nicaragua was rocked by protests and the government’s violent response. While the company’s operations have been entirely unaffected, investors drove shares down 50% from their peak. Polaris chose to mollify investor fears by investing in a collection of operating and late-stage development hydro-power assets in Peru. The purchase included 33 megawatts of completed or late-stage assets, another 20-megawatt development project with a long-term power purchase agreement already in place, and a further 189 megawatts of early stage development assets. 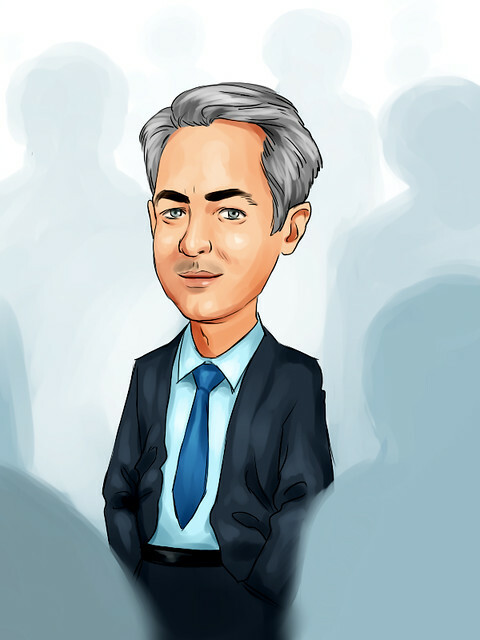 These new assets should increase Polaris Infrastructure’s cash flows over the next few years. More importantly, they reduce the company’s reliance on a single risky jurisdiction. For now, the company will continue to pay generous dividends with the cash its Nicaraguan assets generate. Excess cash flow, plus balance sheet cash, will be used to fund construction costs in Peru and to amortize project-related debt in Nicaragua. Retail Holdings got a little closer to final liquidation, selling off its remaining Singer Sri Lanka shares. The company is attempting to dispose of its largest remaining asset, a majority stake in Singer Bangladesh. Certain of the company’s Singer Bangladesh shares carry restrictions on repatriation. I believe the company will ultimately secure the removal of these restrictions in return for a payment to the Bangladeshi government. Discounting the value of the restricted shares by an aggressive 50% still yields a liquidation value of around $14 for Retail Holdings, 35% above their trading price. I expect the company to announce distributions of at least $1 and possibly $2 when the company updates shareholders in March. The other members of our rural telecom trio, Otelco and LICT, did what they do best. Quietly generate cash, reduce debt, and invest for the future. Otelco’s largest shareholder (no, it’s not Alluvial Fund) was a voracious purchaser of shares to close out the year and now owns over 31% of the company. For its part, LICT Corporation received a buyout offer at a price in excess of $15,000 per share. The board of directors views the offer as inadequate. The most notable newcomer to the Alluvial Fund portfolio may be the simplest business we’ve ever owned. Armanino Foods of Distinction is a producer of Italian foods and ingredients, mainly pesto. I admit it took me a little too long to appreciate Armanino’s virtues to the fullest. If I had done so years ago, we’d all be happily sitting on double or triple our original investment. Still, I happen to think Armanino’s best days are still ahead. While the company has grown its revenues steadily over the years, Armanino remains miniscule in the context of the food and ingredients industry. There is a lot of room to grow, assuming Armanino isn’t snapped up by a larger competitor. Armanino’s product line is very much in keeping with the direction that larger food producers are attempting to go. Armanino’s pesto, for example, is simple and wholesome, consisting only of basil, garlic, parmesan, oil, and salt. Armanino achieves high returns on invested capital, enabling the firm to return substantial capital to shareholders and still grow at a healthy rate. The company has net cash on the balance sheet, even after completing a factory expansion. This is the sort of business where one could pay 25x or 30x trailing earnings and likely still earn a market return over the following decades. Fortunately, we can do far better with Armanino. The company’s shares trade at under 14x trailing earnings, net of excess cash. This is extremely cheap for a company like Armanino that has grown its earnings at a 12% annual pace since 2010 while paying out nearly half its earnings in dividends and reducing its share count by 8.5%. There’s no indication Armanino is slowing down. In fact, pre-tax income grew 11% from 2016 to 2017 and was up another 11% in the first nine months of 2018. Each of these increases came on the back of high single digit revenue increases, indicating the company is enjoying positive operating leverage as it grows. I hope to hold Armanino Foods of Distinction for many years. I expect we’ll receive a healthy stream of dividends along the way and will see our shares appreciate at an attractive rate. It’s now my least favorite part of the investing year. Many of our small companies on a calendar fiscal year do not report results between mid-November and late March, resulting in little new fundamental data to evaluate. On the other hand, it’s a perfect time to look for new opportunities, and that’s exactly what I have been doing. Market downturns usually result in some securities being unfairly punished. I believe this time around is no different. Small European companies in particular have seen their valuations absolutely crushed. It is now possible to buy a variety of good quality small companies at single digit multiples of earnings. Even if the economic outlook is cloudy, I think shareholders buying at these prices will be happy with their decision in the long run. I am eagerly searching through European markets for bargains. Maybe a recession looms, and maybe one doesn’t. I don’t lose sleep worrying about the state of the economy. The economy will be hot and cold in turn, but we invest in securities and companies that don’t depend on Goldilocks conditions to provide an acceptable return. Our portfolio is made up of companies that are not faddish or fashionable. They provide products and services that consumers and businesses want and need year in, year out. Sometimes they need less and sometimes more, but I have a difficult time imaging a world in which nobody desires a broadband internet connection, financing for construction projects, flowers for the front yard, an occasional hamburger, or pesto for that burger. Hey, don’t knock it until you try it. It’s hard to believe that Alluvial Fund has already completed two years of operations. I wish it had taken longer to experience our first down year, but I remain highly confident in our strategy’s ability to produce acceptable returns over a reasonable timeframe. As always, please reach out at any time with questions about the strategy, the portfolio, or just to catch up. I’m an open book. I will be in Omaha in May for the Berkshire Hathaway shareholders’ meeting, and in New York probably twice this year. I would be delighted to meet up. I will share more details when they are available. I hope the year is off to a good start for you and your family, and I look forward to reporting to you once again in April.